Fr. Karl Voelker, SJ is a member of Bellarmine’s resident staff. 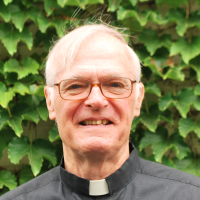 He is an experienced retreat master and spiritual director, including years of service as retreat director and chaplain at the retreat house of the Cenacle Sisters in Wayzata, Minnesota. More recently, Fr. Karl was pastor of the Gesu, the university church of Marquette University, followed by an assignment caring for the needs of retired Jesuits residing at the St. Camillus healthcare facility in Milwaukee.